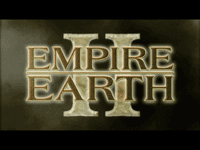 "Empire Earth II, also called EE2, is a real-time strategy computer game developed by Mad Doc Software and published by Vivendi Universal Games on April 26, 2005. It is a sequel to the 2001 bestselling game Empire Earth, which was developed by the now-defunct Stainless Steel Studios. The game features 15 epochs and 14 different civilizations. The game has three playable campaigns: a Korean, German, and American one, as well as several other playable scenarios. The game received a mildly positive reaction, earning a 79% average rating on GameRankings.expansion pack, which was released by Mad Doc Software called Empire Earth II: The Art of Supremacy, was released on 14 February 2006." Source: Wikipedia, "Empire Earth II", available under the CC-BY-SA License.